Staff Sgt. Ryan Scow (left) and Tech. Sgt. Pat Gillen run tests that simulate airspeed to a C5A Galaxy aircraft systems. 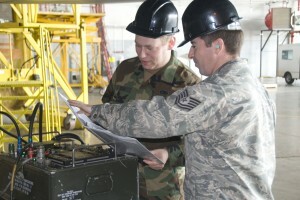 The test is part of a new inspection process known as Maintenance Steering Group 3, which is a proven commercial airline industry program that the 105th Airlift Wing’s Maintenance Squadron has been able to adopt for the entire C5 fleet of the U.S. Air Force. Learning how to take a commercial airline maintenance inspection system and apply it to keeping the massive C-5A Galaxy aircraft based here flying, has earned the New York Air National Guard’s 105th Airlift Wing’s Maintenance Squadron a shot at one of the U.S. Air Force’s most prestigious awards. A 30-member team from the Airlift Wing will be one of two from the Air National Guard’s 89 flying Wings to compete on Sept. 14 against 21 other units for the Air Force Chief of Staff Team Excellence Award. Seven representatives from the team will have 15 minutes to explain to an audience of senior Air Force general officers how Stewart’s aircraft maintainers took the commercial industry proven 35-year old Major Maintenance Steering Group 3 inspection system and applied it to their military air lifters. The Major Maintenance Steering Group concept, known as MSG, was devised by Boeing Aircraft as a way to keep 747-100s flying. The system involves bringing manufacturer’s experts, maintainers, and subject matter experts together in working groups that look at maintenance over the life of the individual aircraft. The key to making the system work successfully at Stewart Air Base is the experience of the National Guard Airmen who work there, said Senior Master Sgt. Bob Pritchard, the inspection section superintendent and a veteran of 23 years with the unit. At an Active Air Force base there’s constant personnel turnover on the flight line, Pritchard said. At Stewart, the Citizen-Airmen who work there have many years of experience with each other and the C-5A aircraft. “They are very passionate about this airframe and they love their work,” Pritchard said. The 105th maintainers took their experience, and then reached out to Active and Reserve Component Air Wings along with Engineers and contractor representatives to refine the inspection system, Pritchard said. “We can put a couple of hundred years of combined aircraft maintenance experience on an issue, think it through, implement the game plan and say, ‘This is how you do it,’” said Capt. Edward De Falcon the MSG-3 Project Officer. The Wing’s Maintenance teams began working on the third generation of MSG in October of last year and had it working by this summer. By utilizing MSG 3 inspections the Air Force can realize a cost savings of $1.38 billion over the lifetime of the aircraft. Stewart’s maintenance specialist shops reviewed and sequenced an unprecedented 417 inspection work cards and over 3,400 tasks to establish the baseline for this new program. The new inspection system is so effective that it can result in five extra C-5s being available for use every day, De Falcon said. Normally about half of the 111-aircraft C-5 fleet flown by eight Air Force wings is available at any given time. Five additional aircraft a day, for a plane the size of the C-5, results in a major increase in the Air Force’s ability to move critical cargo around the world, DeFalcon said. “MSG3 proves there is a better way to inspect C-5 aircraft, save taxpayers’ money and is a tremendous achievement crafted here at Stewart by 105th Maintenance Squadron personnel, the best maintainers in the fleet” said Brig. Gen. Verle L. Johnston Jr., the commander of the 105th Airlift Wing. The 105th Airlift Wing is one of three Air National Guard units in the country with an operational C-5 mission. The unit’s 13 aircraft regularly fly missions around the world in support of America’s armed forces. Stewart Air National Guard Base is located just 70 miles North of New York City. The 105th Airlift Wing recently celebrated its 25th anniversary at Stewart Air National Guard Base and has a 60-year proven track record for answering the call to duty both in New York State and around the globe.